May God bless you and keep you over the Labor Day holiday weekend. Enjoy your family. Take a moment to rest. Get out and enjoy the fresh air. Do what you want to do this weekend! Don’t spend another moment worrying about things or people you can’t change. Just enjoy the life God has given you. Take a trip with me to the day you declared you would start something new. God gave you the vision for a business, to go back to school, to relocate, to start a church, to start a ministry, to start a family, etc. and you were all excited and ready to go and then BAM before you could officially get into a groove life happens. Distractions come from the east and the west, road blocks appear to look like mountains, discouragement is plastered on billboards all over town, fear creeps into your mind and holds you captive and these are just a few things that have happened along the way. That energy and excitement you started with on day one is slowly seeping out like the air in a tire with a small puncture. You can’t seem to find the pep in your step and giving up seems like the easiest thing to do. BUT Wait!!! Don’t give up! Don’t abort the vision! It’s time to remain determined to finish! Did you know that the journey in between the start and the finish was strategically designed to cause you to draw closer to Christ? Did you realize that everything you deal with will be used to equip you for the call that is on your life? I am here to encourage someone today, don’t allow fear, distractions, obstacles or even naysayers to keep you from walking in your calling. As a child of God, you are on the right team! The Lord is on your side and with Him on your side you do not have anything to fear. Man can’t do anything to you. Although they may try to kill the dream and push you towards wanting to quit, their attacks are futile. How awesome is our God!?! Demons tremble at the mention of His name and because He is on your side they will tremble when you step on the scene. Walk in the confidence that you serve a God who is more powerful than any trick from the enemy. I want you to go back to that vision and decide today that you are DETERMINED TO FINISH!!! God bless you. Now get to work and be encouraged! Good afternoon! Happy Monday. I pray your weekend was blessed. We are officially in the last full week of August. How has your 2014 been so far? Has it been good, great, so-so, bad or terrible? No matter what your year has been like, we still have 4 months left in the year and that is plenty of time to turn things around. 58 With all this going for us, my dear, dear friends, stand your ground. And don’t hold back. Throw yourselves into the work of the Master, confident that nothing you do for him is a waste of time or effort. Have you ever noticed a tree on a windy day? The leaves may blow to and fro, some may even fall off and blow away. The branches may bend and sometimes break, but the trunk of the tree NEVER MOVES! When I look at the Christians today, many of them look like the leaves on the tree-so easily blow away. They know what the Word of God says, but when the world says something that seems more popular or favored then they blow away and operate like the world. Then you have some believers who operate like a branch, some may bend, but are not as easily broken or swayed by public opinion, but occasionally you will run into a tough Christian who caves under pressure and actually breaks. Then you have the Christians who are planted deep in the Word and Ways of the Lord and are like the trunk of the tree. The winds of life may come and the world may look enticing, but they will hold fast to their beliefs. There is a saying, “If you don’t stand for something you will fall for anything.” As believers of Christ, we should live a life that is set apart.We shouldn’t look like, act like, talk like or think like the world. We need to be like the trunk or base of the tree. We need to be firmly rooted in Christ so when the storms of life blow, we will stand firm and in position. When was the last time you took a stand for something you believed in? When was the last time you held your position when it came to the matters of the kingdom? In these last days, you will be tempted to sway not only by the world, but by those in the church. Are you willing to stand your ground if something doesn’t line up with the will and way of the LORD? Are you willing to back your position up with the Word? Are you willing to forfeit temporary position with man for eternal position with GOD? These are tough questions that we should all ask ourselves. Just because someone is quoting scriptures doesn’t mean it’s of God. Even the devil knows the Word of God. Make sure you learn the Word for yourself and take a stand. It’s time for you to take a stand and hold your position. So what if they say that everyone is doing it or Minister “So-and-so” said it was good, or it feels good. When a person is easily swayed they are easily dismayed. I urge you to take a stand. Examine your life and fight to hold your position when it pertains to spiritual matters. Don’t compromise your soul for title or position given by man. Don’t compromise your life for money or fame. HOLD YOUR POSITION! I have great news!!! I will resume posting regular devotions on Monday, August 25, 2014. I have been embarking on a spiritual journey that has been so rewarding and has taken up some very important time. I have missed my blogging community and pray you have continued seeking God’s word daily. I encourage you to “Like us” on Facebook at “Sunshine’s Reflections“, where scriptures are posted daily. I will see you on the information highway on Monday! God bless! 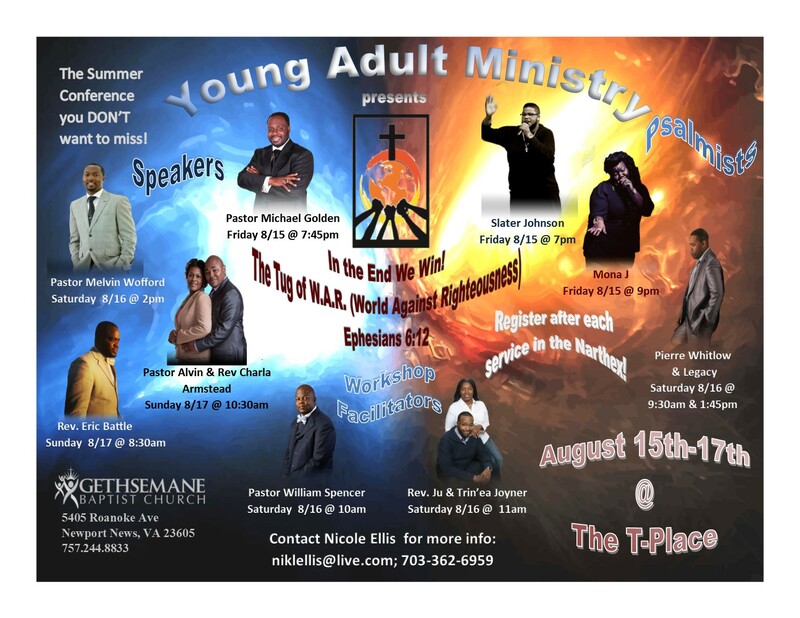 Don’t miss this powerful conference! This event is FREE and OPEN to the PUBLIC (ages 18 and up). In the end WE WIN! 12 For we do not wrestle against flesh and blood, but against principalities, against powers, against the rulers of the darkness of this age,[a]against spiritual hosts of wickedness in the heavenly places. o This session will address how to identify who is currently holding the rope in your life; Satan, self or God. • 9:00pm-11:00pm Kickoff After Party (Mona J) Refreshments will be served. Christians can have fun too! Come join us for this awesome Conference Kick-Off Party! o This session will talk about the importance of surrounding yourself with the right people. • 11:00-11:45am Breakout session (men/women session) Get Ready, Get set, TUG! o This session will talk about the different types of spiritual tug-of-wars we can have; self, drugs, alcohol, promiscuity, lies, etc. Men and women will break out during this session. o This session will summarize all the sections and stress that when we are on the Lord’s side, no matter how gruesome the battles may be, we win. Come find out how to deal with the struggles in life and more importantly learn the outcome as a believer in CHRIST!!! We hope to see you there! God bless!